In the 17th century it was observed that the Sun turns around its axis every 28 days approximately, in the same direction as the Earth – from the West to the East. As the Sun is not a solid body, its different parts rotate at different rate, depending on their distance from the solar equator. The rotation period changes from 31 days near to the poles to 27 days in vicinity of the equator. There are different signs of solar activity such as the sunspots, the protuberances, and the chromospheric flares. The sunspots were known already in antiquity. They are mentioned in the Chinese records as well as in the relations of the British sailors and the old Russian chroniclers. Actually the sunspots are just the darker areas in solar photosphere of size from a few to 100.000 km and lifetime from tenths of days to a few months. The sunspots are related to the magnetic field, and their pairs have always opposite polarities. 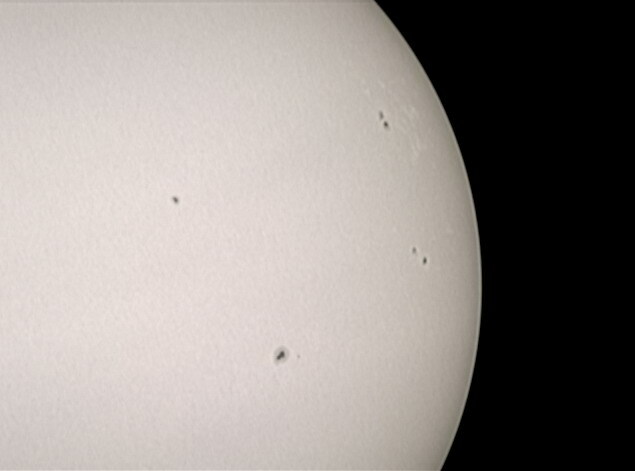 Groups of the sunspots emerge suddenly. Usually we can see two spots, in whose vicinity the smaller spots appear gradually. Their number grows steadily by 2-3 weeks, reaching a maximum, and then again falls down. The number of sunspots varies periodically, reaching its maximum every 11 years. How to build a low-cost observatory in your school with EU-HOU help? You will be suprised to learn how many interesting observations can be performed using systems readily available to schools. Read more: Astronomical observatory in your school ? Learn the basics of image processing and discover the moons of Jupiter! A simple exercise on how to process film taken with a webcamera and enhance image quality to see the Galilean Jupiter moons. You can download a film in the AVI format with sample observations and try image processing algorithms by yourself.